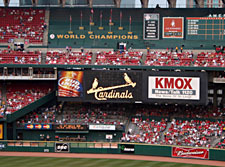 Over 50 people from Wabash and DePauw gathered to watch a Cardinals home run fest Friday, June 24, 2005 as the Cards beat the visiting Pirates 8-1. The group was treated to some pre-game fireworks as several explosions at a nearly plant brought CNN attention to St. Louis and the resulting fire delayed the start of the game by 30 minutes. Charlie Raiser ’69 reported that it’s the first time in history that a major league baseball game was delayed by a fire. The game started as a real pitchers duel on a very hot St. Louis evening. However, the bats of the Cardinals were just too much as 50% of the St. Louis hits were home runs! In addition to Wabash alumni, the group included several prospective students and their parents. Many thanks go to Charlie Raiser ’69 and his wife Jill for arranging the entire evening.